Searching for fonts that look like Termina? Look no further! 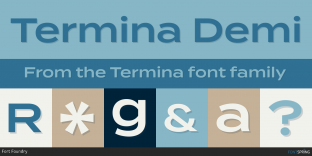 Here you will find fonts that look like Termina. Use the selector above to match other fonts in the family. 80% off until Jun 1st! 50% off until Apr 30th! 50% off until May 3rd! Worry-Free! Conthrax Typodermic Fonts Inc.
- 85% off until Jun 1st! Worry-Free! Presicav Typodermic Fonts Inc.
80% off until May 31st! Worry-Free! Craft Gothic FontSite Inc.